Since my previous post on this topic. . . So You've Missed the Kickstarter: Some of you were interested in catching up with this book's crowdfunding event, which ended January 7th. If you are interested in supporting this project, please contact me privately at Bruce Heard [at] Stranger Skies [dot] com. Let me know what you want or if you would like to include add-ons listed on the Kickstarter page. I'll let you know what the next few steps are when you get back in touch with me. Some of you may remember this process (it is the same one I used after CAL1 "In Stranger Skies" in 2014). Uncollected Pledges: Some of our backers' pledges are still pending. Kickstarter staff will keep addressing wayward/delayed transactions for the next couple of weeks. After this, these pledges will be cancelled. There are enough of these so far to cause the fourth stretch goal to be cancelled, if they remain unresolved. It would be unfortunate for everyone. So please, if you have been notified that your pledge could not be collected, do work with Kickstarter to resolve the issue as soon as possible. Surveys Are Out: I just e-mailed the Kickstarter surveys to all backers. Please fill those out when you have a minute so we can figure out who gets what add-ons, e-mail addresses, mailing addresses, and so on. As soon as the surveys have been returned and Kickstarter's collection process has been completed, I can generate art orders and contracts for the book's cover and internal illustrations. The sooner the better. Free Character Sketches from Joe Garcia: Backers at Admiral pledge level, you do qualify for a free character sketch by illustrator Joe Garcia. Questionnaires have been sent out via Kickstarter to help you describe your characters. Please check your Kickstarter accounts for messages as soon as possible. These sketches will be drafted on a first come-first served basis. Some of you have already delivered your descriptions -- thank you! Ideally, Joe should be working on these sketches BEFORE he receives his work order for the book's illustrations. Commissioned work will take precedence over complimentary sketches. Thank you all for your cooperation and your patience. There still is quite a lot of work to be dispatched. Before I go into this, I wanted to first thank everyone for their kind support, whether it came in the form of pledges or efforts to invite friends and people who may be interested in the Calidar series. Since a post-KS option will soon become available, please do keep up with this effort. There's still room for more fans to see their names in the project's Honor Roll (more about this in a moment). Kudos to you all, as "Beyond the Skies" would not be the same without your support. A Few Facts. Here are some interesting figures about the crowdfunding campaign. The average pledge came up to about $64 dollars, including add-ons. Our backers' bids seem pretty evenly spread out. 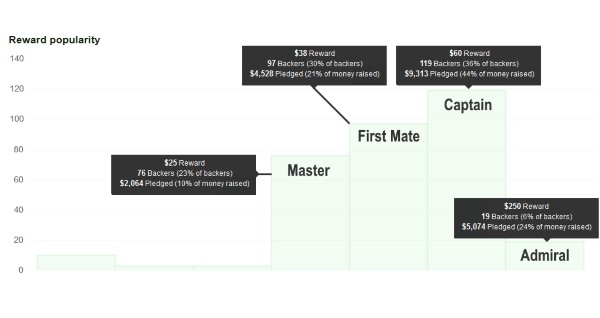 If you look at the next chart, you'll see that 42% of backers picked Captain or Admiral tiers. This shows the impact of having so many add-ons to offer. Many backers saw this and increased their pledges to cash in of these offers. Thank you! What does this amount to? For one, we have good amount of internal art gracing this book's pages. We did not hit the "dream goal" of one illustration for each god, but that's still a lot of art to commission. As the result of this, the book's page count is (so far) going to come close to 248 (the minimum was 220, remember?) In addition to internal illustrations, don't forget a lot of maps rendered by Thorfinn Tait, color floor plans, pantheon diagrams, and various divine symbols to make a good use of the book's full color printing. What if you missed the Kickstarter? No problem. A post-Kickstarter page will become available very soon on StrangerSkies.com. Here are tentative details. This page will offer most of the pledge levels and add-ons for a while longer. 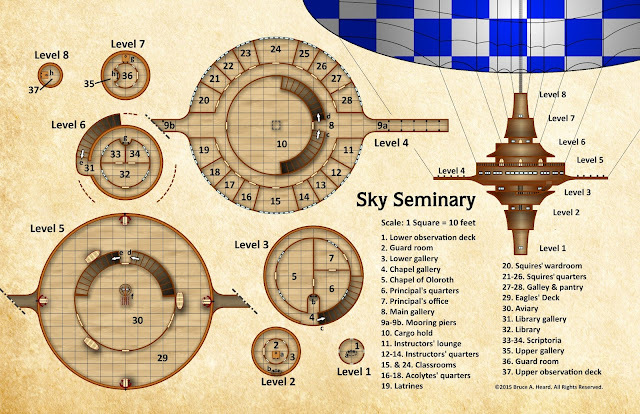 Add-ons such as CAL1 Stranger Skies (printed versions and PDF) and poster maps will be switched off from the post-KS page at the end of January (they are still available through normal channels on StrangerSkies.com and DTRPG). The post-KS page itself will be shut down at the end of February. Here is the original list of add-ons. Please note that free character sketches from Joe Garcia (offered at Admiral pledge level) will not be honored via the post-KS page. The Battlebards offer still stands, although registration to obtain the sound samples and access to the Calidar soundboard ends on March 31st. Registration will begin as soon as the list of qualified backers can be compiled. Find out more about this here. 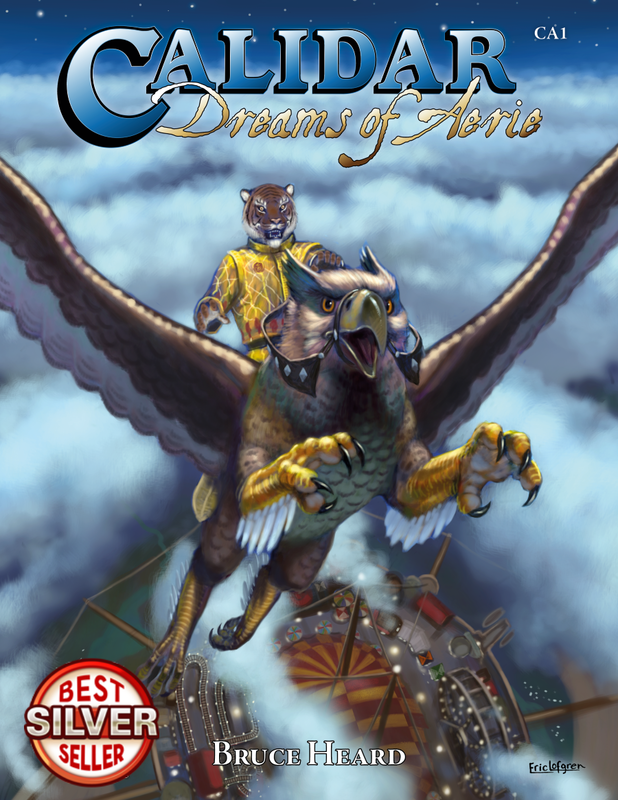 Starting in March, visitors who missed the post-KS offers can preorder "Beyond the Skies" possibly at a discount. Kickstarter fulfillment takes place first as soon as the book becomes ready for print. Pre-orders will follow shortly afterward. General sales via DTRPG or StrangerSkies.com start last, after I've restocked, so this could happen 1-3 weeks after pre-orders are sent out, somewhere around August 2016. Links to download some of the PDF files may be e-mailed from DTRPG fairly soon since these are ready to go (CAL1 "In Stranger Skies" and CST1 "Under the Great Vault"). Do check your spam box as those messages tend to end up there. There will be timely updates here and on the KS Updates page for all this, so keep your ears to the ground. If you need to contact me, please go the Kickstarter page and send me a private mail from there (click on my picture and the "Contact Me" button). A survey will soon allow KS backers to update their mailing addresses and clarify their orders. That's about all can think of bringing up at this time. Do ask questions if you feel I missed something. Til then: Happy 2016! Last Day for the Kickstarter! 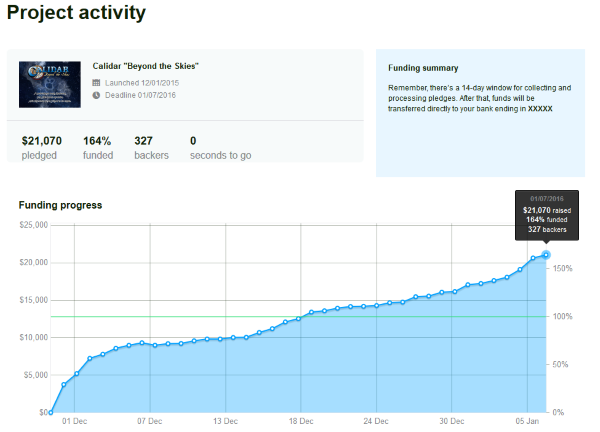 #Calidar "Beyond the Skies" is fast approaching its next stretch goal and reaching the end of its crowdfunding campaign. Thank you everyone for your generous support! Visitors who haven't yet jumped in: will you put some of yourself into this fabulous book and join the effort to commission more internal art? 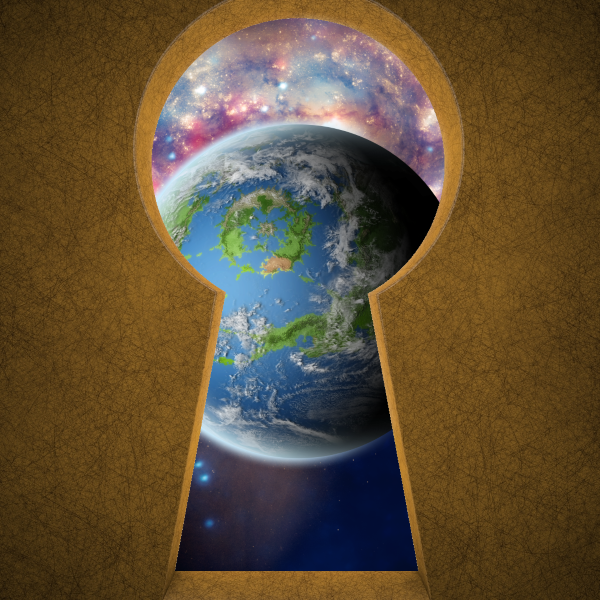 "Beyond the Skies" has already grown from 220 to 244 pages for everyone's enjoyment... will today add more? “He be an Aran wizard, fer sure.” The voice sounded muffled at first, and thick like a peasant’s. A dull ache throbbed in Dardaniel’s cranium while his senses slowly returned. He tried opening his mouth and felt the painful grip of an iron muzzle holding shut his jaws. Someone had gone a long way to ensure he could not speak. Lying face down against a filthy stone floor, his hands bound behind his back, he twisted his neck to see around him. He lay at the bottom of a pit, under a feeble light filtering in through iron bars at the top. However careful his movement, Dardaniel could not prevent his iron mask from rubbing against the rough stone floor. Fifteen feet above him, the conversation ended, and the silhouette of a head appeared above the iron bars. “Heh, he be awake now. Ye stay nice an’ quiet, wizard, if ye know what’s best fer ye,” the guard said in a gravelly voice, before vanishing. The sound of footsteps and a heavy door slamming shut informed him that perhaps he was now alone. Dardaniel sat up as best he could. He had no idea how long he’d been in this oubliette, or where in the blazes this prison lay. Hours went by, perhaps days. His rusty manacles were murder on his wrists. Someone showed up and tossed scraps from a meal that landed in a murky puddle. Torn by the pangs of hunger, Dardaniel crawled to the sordid pile and attempted to gnaw at the pungent remains. His muzzle made the affair nearly impossible, and he only managed to slurp in some of the puddle while the guard snickered above. His face smudged with greasy muck, the wizard gave up on the odious endeavor and lay on his side. A fat rat trotted out of the dark, sniffed at the helpless intruder, and decided the leftovers were easier pickings. . . for now. Time went by until a breath of air disturbed his dreams of freedom. Keeko had landed on the floor next to his face, and was peering at him with its two big round eyes, while ethereal wings on its back faded from sight. The prosapian examined the iron mask for an instant, climbed on its side, and tugged on a latch pin with its two small hands. Its effort paid off when the metallic piece fell out and rang on the stone floor. The muzzle clicked open and Dardaniel shook it off with relief. He could utter little more than a pitiful gurgle, so dry his mouth had become. Despite his weakness, the wizard sat up as Keeko observed the manacles’ sturdy rivets. It then approached the pile of refuse, seized a rancid piece of fat, and proceeded to rub it against Dardaniel’s wrists. Clever little beastie, the wizard thought, increasingly hopeful. He joined his fingers as tightly as he could and pulled hard. The pain was excruciating. He thought for a moment he’d broken a few bones when his knuckles finally slipped free of his iron bonds. It helped that he was slim of build. “Thank you my little friend,” he whispered in a hoarse voice, looking up at the top of the pit. Keeko deployed his wings and flew up to the grate, grabbed a metal bar, and crawled out. Dizzy with fatigue and lack of food, Dardaniel checked his pockets. Alas, someone had emptied them already. He then thought of uncast spells still lingering in his mind, and realized he’d have to take a chance. “Look out,” he cautioned Keeko before he uttered his magic. A loud knock flung the grate open, after which the prosapian reappeared at the pit’s edge, a quizzical expression on its furry face. “I know, I know,” admitted Dardaniel at the unspoken question. “I didn’t memorize the fly spell. Hate the very thing, I do.” Annoyed, the wizard wondered how he’d climb out of the oubliette. The stonework was rough enough, but he lacked the skill that could help him up the somewhat wet incline, as the pit’s bottom was wider than its opening. Slight grunts sounded until Keeko dropped a rope inside. Despite his weakness, the wizard climbed out and sat on the edge to catch his breath and look around. A small brazier glowed in a corner, revealing a torture chamber, with racks of wicked tools and a number of doors on all sides. The ceiling above the pit held a pulley and a rope with one end secured to the edge of a heavy wooden table fitted with manacles. None of the wizard’s equipment lay in sight. Annoyed, Dardaniel stood and picked up a nearby lantern, which he managed to light up with a hot poker. He then investigated doors featuring small barred openings. Each revealed an empty cell with shackles, save for one that held a sorry-looking fellow. He raised his head when called out, and despite the prisoner’s hirsute and haggard appearance, Dardaniel recognized someone he’d once known in Sundsvall. Syphonean raised his shackles, resigned to his fate. After grabbing a set of hefty pliers from a tool rack, Dardaniel returned, cast off the bar holding the door, sheared the shackles’ chains, and helped the old man out. “Who? Zandor?” Dardaniel pressed on, stunned and increasingly dismayed. Dardaniel opened his mouth, but remained speechless while myriad questions jostled in his mind. It was a crushing revelation. At once, the wizard understood why Zandor wanted Syphonean dead, along with anyone associated with him, abductors and rescuers alike. Murder among Alphatians was still a capital crime, no matter who committed it, and Zandor wanted all evidence obliterated. Click on the Short Stories label below to display all the short stories. The holidays may be over and Jack Frost settling in, but here's some good stuff guaranteed to give you a warm and fuzzy feeling all over. I got an exclusive preview on EnWorld's front page that could be used for a short adventure on Calidar on any world setting. 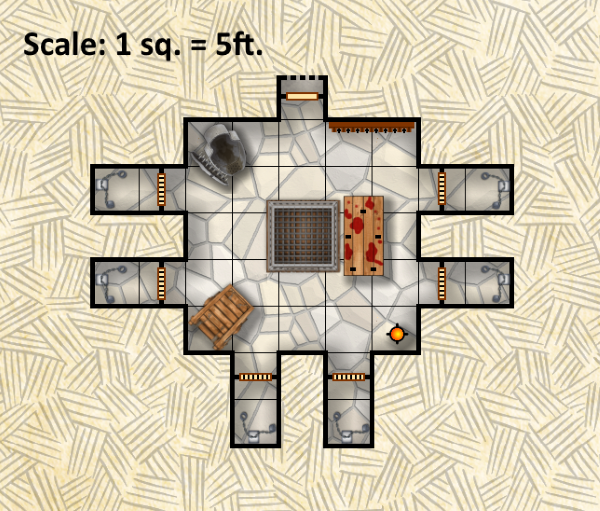 I included the floor plan here so you can see what this is about. This article describes an order of eagle-knights and their "flying seminary," a sort of airborne school/temple/aviary. Does your hero have what it takes to survive training and become a trusted alumnus? The source material is Calidar's upcoming title, "Beyond the Skies." It demonstrates how a book about deities can bring to life realms of the Great Caldera, in some ways like a gazetteer. Crowdfunding for this sourcebook is still live until January 7th. New rewards have also been added recently, making this a sweet deal, better yet than the one for "Stranger Skies." 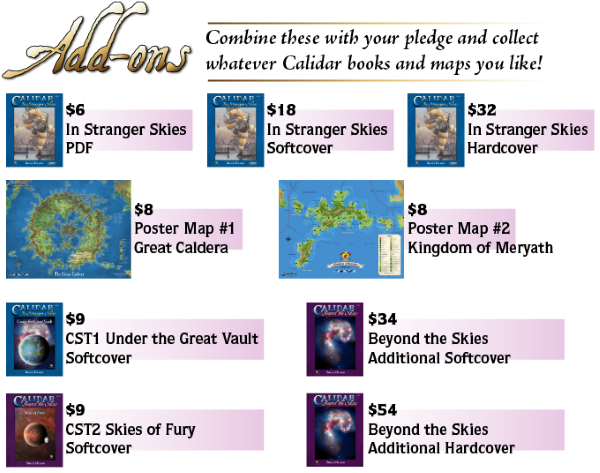 If you're new to Calidar, all previous books and poster maps, including those offered exclusively to Kickstarter backers are available at a discount during this campaign. Now's a good time to jump in if you haven't already! I made a fortuitous and auspicious encounter a few days back, which resulted in more good news for Calidar's "Beyond the Skies" kickstarter. At this time, we're just a few hundred dollars from blowing past the 2nd stretch goal, which means more illustrations added to the book's contents. 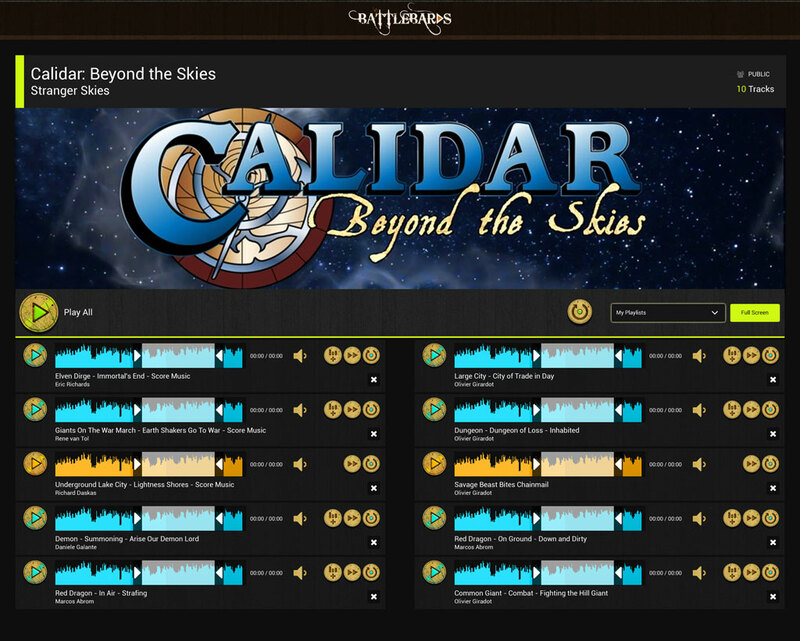 As Calidar's crowdfunding reached new heights, I connected with the folks at BattleBards.com who kindly offered a free reward for Calidar's current and upcoming backers. This includes a custom Calidar Soundboard with 8-10 sound tracks. These tracks will enhance and add nuances to the experience of playing in the World of Calidar. The Soundboard provides easy access to the audio and the ability to organize and play tracks on-the-fly. They can be listened to individually or layered with multiple tracks for added effect. There is no access fee associated with this reward, which is offered to Calidar backers at First Mate or higher pledge levels. Battlebards successfully completed their own Kickstarter recently and is poised to launch their new service by the end of January 2016. Registration to qualify for the free rewards will begin by the end of Calidar's crowdfunding campaign, January 7th, and end on March 31st at midnight. Battlebards.com is the most expansive tabletop sound library ever assembled, along with tools built specifically to use the audio masterfully during games. Tailor-made background music inspired by fantasy races, voiceover scripts written to bring life to everyday character interactions, and a colossal array of bone-crushing, spell-fire-blasting sound effects: this is immersive tabletop gaming at its best. Stay tuned for further updates on this subject. Don't forget the extra reward at Admiral pledge level, which was another offer that came up during the crowdfunding effort. Joe Garcia, illustrator for "Beyond the Skies," kindly offered to sketch a free character for Admiral backers. This process will also start at the end of the crowdfunding campaign. As with the Battlebards offer today, Joe's generous contribution was announced via my Kickstarter project update (it isn't listed in the reward's description). If you haven't backed Calidar "Beyond the Skies" as yet, there are just a few days left to do so. This new release goes beyond bringing to life fantasy gods, their personal relations, and politics between pantheons. It also provides a massive list of individual powers available to mortal followers, zealots, and priests (based on their piety levels), as well as divine favors encouraging desirable behavior, and divine wounds reflecting discontent among deities. "Beyond the Skies" unveils new information about world souls, the Dread Lands, native monsters, shamans of the tribes, spirits of nature, and seitha prospecting. Divine servants, demons, incarnates, and household godlings also make an appearance, along with a host of floor plans detailing temples and the lairs of secret brotherhoods, each an invitation to run adventures. Calidar's background dynamics involve a dark peril that threatens to destroy both the divine pantheons, the world souls, and the mortal universe, evoking a pervasive sense of impending doom. This book is crucial for the understanding of Calidar as an RPG campaign setting because it fleshes out a lot of information about the ten realms of the Great Caldera and the origins of their peoples. In its own way, it qualifies as a macro-gazetteer. 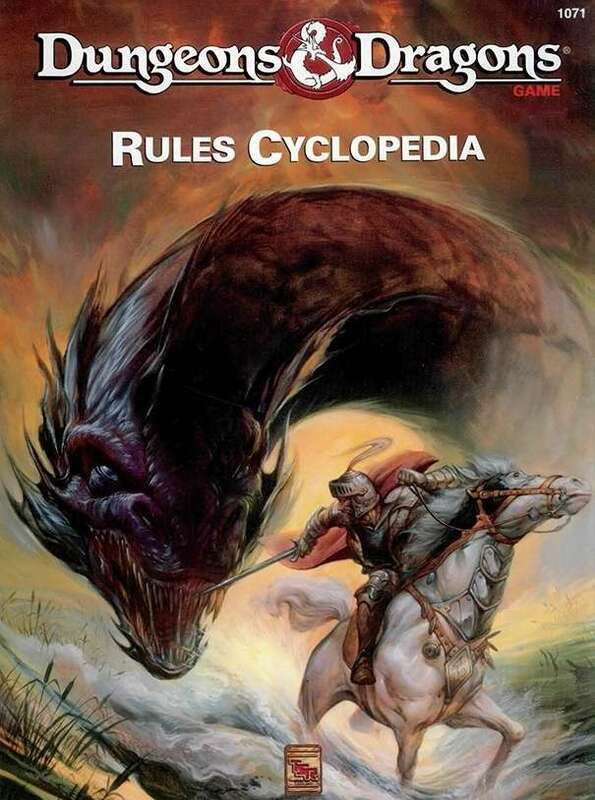 It will directly impact all future gazetteers, and thus is a must for fans of this game world. The pantheons are also designed in a such a way that they can be used in other game settings with minimal trouble. If you haven't jumped in yet, click on the image below to reach the crowdfunding page.